Boomer audio subsystem for cell phones. NATIONAL Semiconductor, represented by Arrow , has introduced a Boomer audio subsystem for cell phones that integrates amplifiers, volume and mixing controls and 3D sound in a micro SMD package. The Boomer audio subsystem, coupled with National's amplifiers, audio, display and power management systems allows phones to be used as fully-featured entertainment devices due to its true sound, long battery life, multiple mixing and switching features, and small size. National's LM4857 also anticipates the feature demands of next-generation handsets giving designers flexibility and consumers good quality audio. 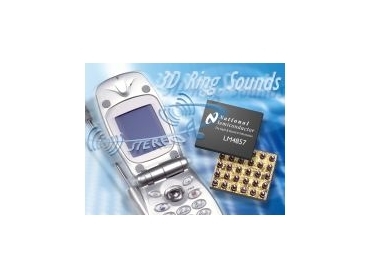 National's LM4857 integrates stereo speaker drivers for the handset with 495mW output power per channel, a 33mW stereo headphone driver with 32-step volume control and independent left, right and mono volume controls. Operating on a 3.3V supply, it combines a stereo speaker amplifier for improved sound quality over single mono speakers, a mono earpiece amplifier that delivers 43mW into a 32Ω load, and a line output for an externally powered hands-free speaker (such as a car kit). The LM4857's 3D enhancement provides stereo channel separation when the left and right speakers are too close together and solves problems that would otherwise arise from system size constraints or equipment limitations. In addition, the LM4857 routes and mixes the stereo and mono inputs into 16 distinct output modes that give designers flexibility to route and mix mono and stereo audio signals without limiting routing to stereo speakers or stereo headphones. The LM4857 is controlled through an I2C compatible interface.